Most Russians (43%) would treat as quite favorable their close relative’s decision to enter a monastery. PRAVMIR. July 1, 2014. 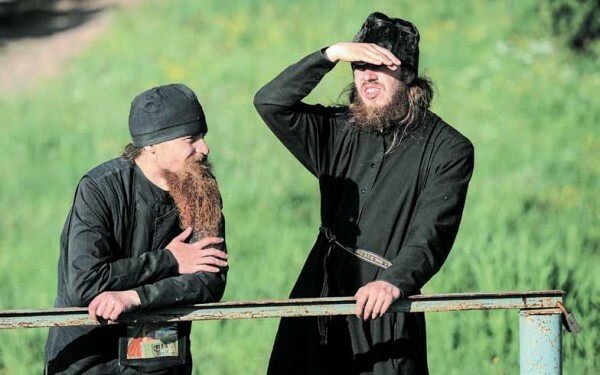 The All-Russian Public Opinion Research Center (VCIOM) has reported what, according to Russians, motivates people to enter a monastery and how Russian citizens would react to the decision of their close relatives to become a monk or nun. Reflecting on what motivates those who enter a monastery for good, one in five (19%) of those surveyed suggested that people become monks to escape problems and bustle, states VCIOM. According to the 8% of the respondents, people do so in accordance with their beliefs and faith, and 5% said they have probably found their calling. Others suggest that they wish to become closer to God (6%). Another 6% said that those who enter a monastery for good need to atone for their sins. Their goal is to find themselves and the meaning of life, suggested 4% of the surveyed. According to two-thirds of Russians (63%), monks – thanks to a desire for their soul’s salvation – are likewise able to help others. This view is shared more by Orthodox Christians (70%) than by other religions (49%) and non-believers (31%). In turn, 27% ​​of those surveyed think that monks are unable to help others because of their isolated and reclusive lifestyle, and such is the opinion of low-income respondents (38%) and rural residents (33%). The desire of a close relative to enter a monastery, one part of Russians (43%) would treat quite favorably, while others (40%), in contrast, spoke about this negatively. This decision would most often be supported by the older generation (47% of those 45 to 59 years), Orthodox Christians (47%), whereas the opposite position would be taken by 18-24 year-olds (45%), Moscow and St. Petersburg citizens (46%), and atheists (55%). The opinion poll of Russia citizens was conducted by VCIOM on May 10-011, 2014. 1,600 people were interviewed in 130 villages of 42 Russian regions. The statistical error does not exceed 3.4%.